Here’s what’s happening in the world of television for Friday, June 15 and Saturday, June 16. All times are Eastern. 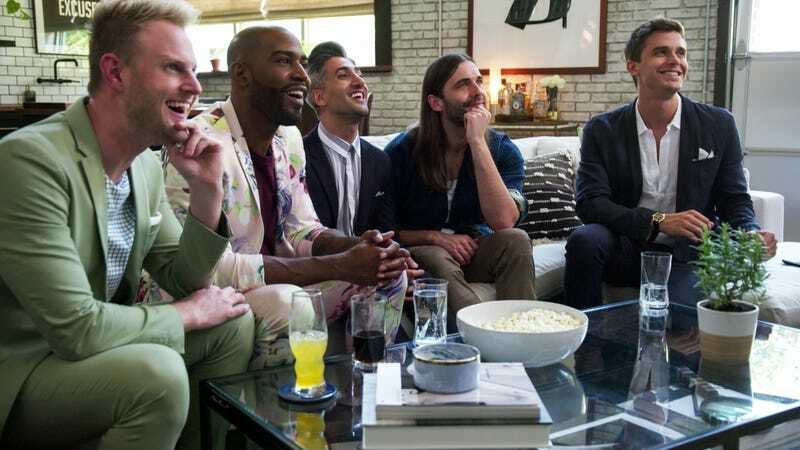 Queer Eye (Netflix, Friday 3:01 a.m.): The Fab Five 2.0 return to Netflix just four months after the first season of this reboot premiered. Apparently, these episodes were filmed immediately after season one had wrapped and made viewers fall in love with makeover shows all over again, which is why they’re seeing a summer premiere. Queer Eye offers its styling, home, and lifestyle advice to eight new contestants, including a trans man, a Georgia woman, and a bartender who needs to ditch the logo tees. So tonight, prepare a feast in Antoni’s honor and settle in for season two. Wyatt Cenac’s Problem Areas (HBO, 11:30 p.m.): Wyatt Cenac’s funny and thoughtful docuseries has gone from promising newcomer to vital fixture in the late-night lineup. The animated sequences offer fanciful flourishes between the monologue—such as it is—and the in-depth segments that dominate the second half of each episode. True to his word, Cenac has spent the first season delving into policing and racial inequities in the broader criminal justice system, lending an ear to community activists while also offering a modest proposal or two. The penultimate episode devoted to restorative justice emphasized building strong children over repairing broken individuals was a high-water mark for the series. So for the finale, Cenac is going back to school—to investigate the lack of funding for teachers in this country—as well as traveling to Cincinnati to explore a “collaborative agreement” between the city’s police department and black residents. Goliath (Amazon, 3:01 a.m.): Billy McBride (Billy Bob Thornton) takes on a drug cartel in season two of this David E. Kelley drama, which sounds like an appropriately outsize task for a show named Goliath.